Mr. Dan Welby’s teaching style allows his students to discover their independence and confidence with ease. His straightforward approach is accompanied by his fun loving sense of humor. Dan’s ultimate goal as a teacher is to help the student help himself. He introduces basic reading and rhythm counting right from the start, which are the two most important tools for self-reliance. . This concept will be nurtured through the entire scope of their study. Dan pays close attention to techniques used for hands and feet. These techniques provide the physical dexterity needed to execute what they have learned to read and count. Lessons will quickly move towards applying the fundamentals to learning songs. Music is the ultimate reason for learning to read, count and play. Dan writes most of the curriculum used in his lessons. He also incorporates traditional and modern approaches from many authors in the drumming world. As the lessons progress he encourages his students to take more control. He then takes on the role of a coach in the later stages of the student teacher relationship that then allows great creative freedom to bloom. Mr. Dan Welby has been drumming for 17 years and teaching for over 9. In the beginning of his drumming career he studied with an amazing teacher in his home state of Massachusetts as well as playing in the local Heavy Metal scene with a band called Hostile Groove. In 1999 he came to study in Hollywood, CA. He graduated from The Musicians Institute with a Professional Certificate in 2000. He was then offered a job at the school as a teacher providing private instruction; open counseling and supervising the Hard Rock and Heavy Metal live playing classes. Dan still holds a teaching position at The Musicians Institute part times as well as teaching at The Music Castle. 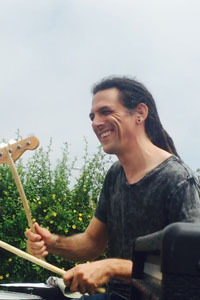 His passion for playing live keeps him busy with various bands in Los Angeles. If you are looking for drum lessons in Santa Monica look no further.